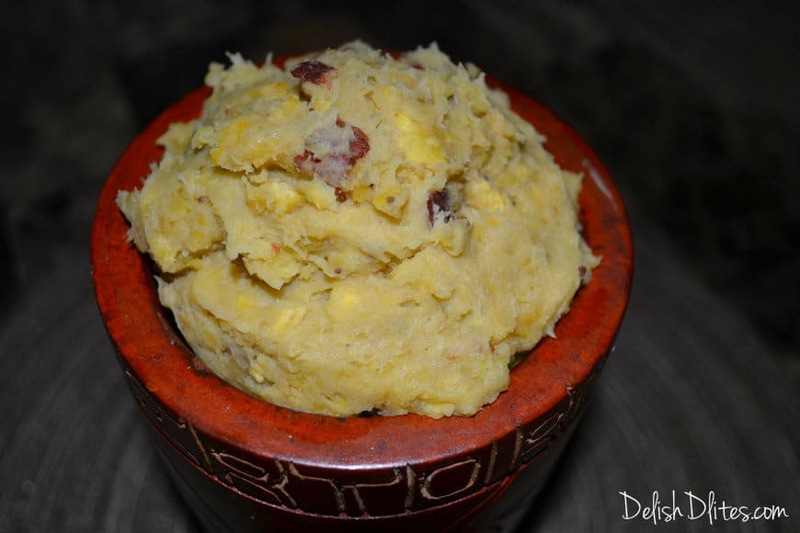 I’m obsessed with mofongo. Every time I visit Puerto Rico, I make it a personal mission to eat it as many times as humanly possible. I’ll order it at every restaurant we go to. Seriously. 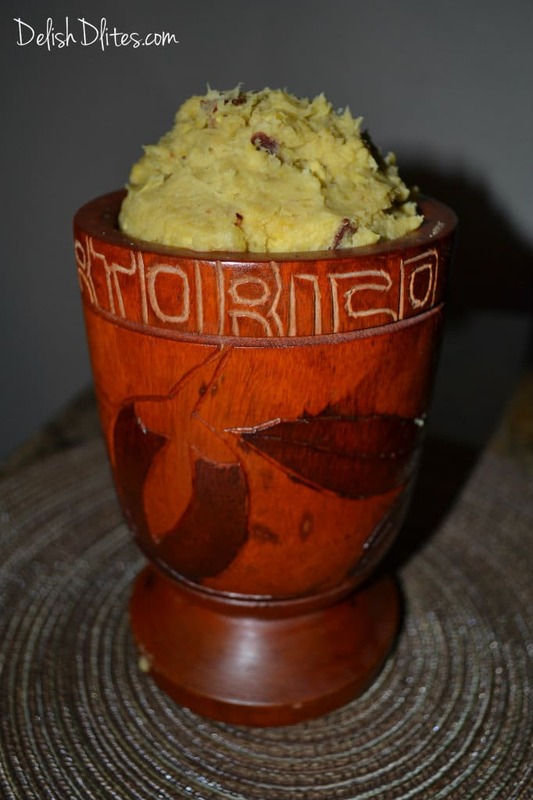 Traditional mofongo consists of fried mashed green plantains, mixed with fried pork skin. 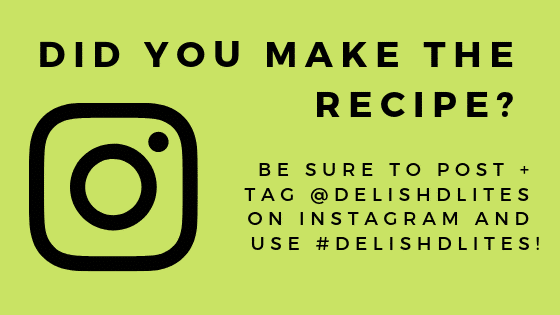 Yeah, delish, but definitely not that kind of thing you want to eat on the regular (unless you’re on vacation, no rules apply at that point!) In an effort to have my cake and eat it too, I experimented with different ways to lighten up this fattening dish, with amazing results. 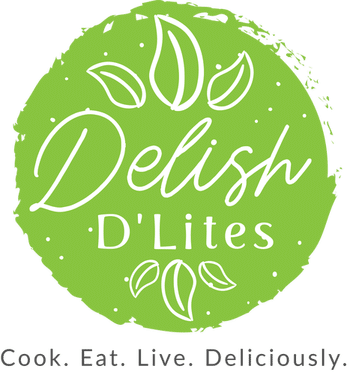 This dish is almost fat free, really! My favorite way to using this version is as a stuffing for Thanksgiving turkey (see my Pavochon post!) or with chicken soup. This is also delicious as a side to some stewed chicken (pollo guisado) or shrimp in garlic sauce (camarones al ajillo). But I suggest you try it as an alternative Thanksgiving stuffing, you will NEVER go back to plain old boxed stuffing again! Promise. Pour the 12 cups of water into a large stock pot. Add in the bouillon cubes. Peel your plantains. Don’t know how? Don’t worry, I’ll show you! 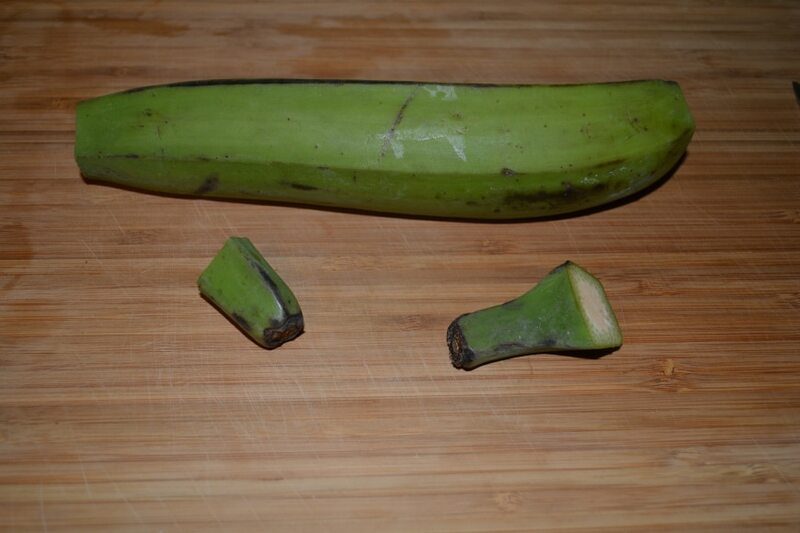 First, cut off the ends of the plantain. 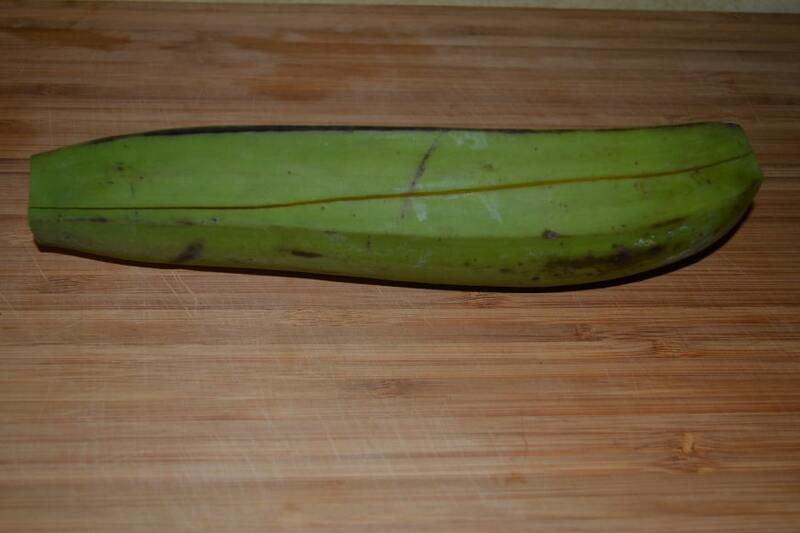 Next, cut a vertical slit along the length of the plantain. 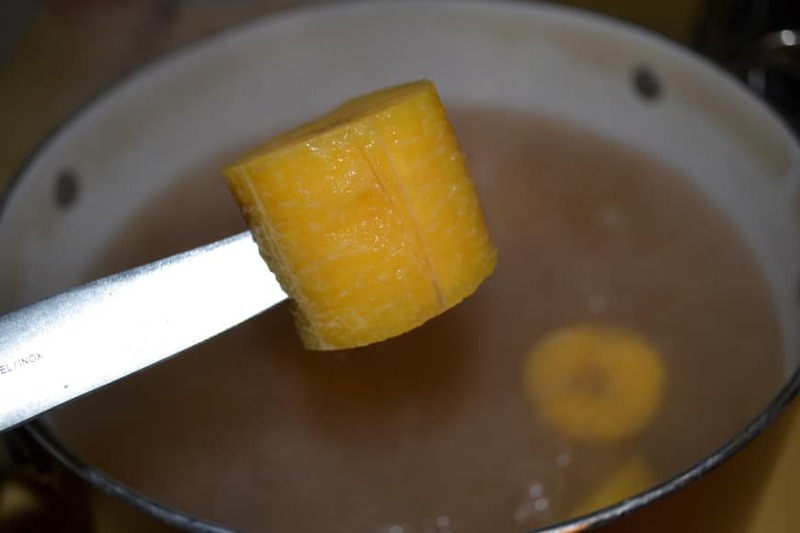 Using a small paring knife, pry the peel away from the plantain flesh by sliding the knife in between the skin and the flesh, and twisting the knife up slightly. 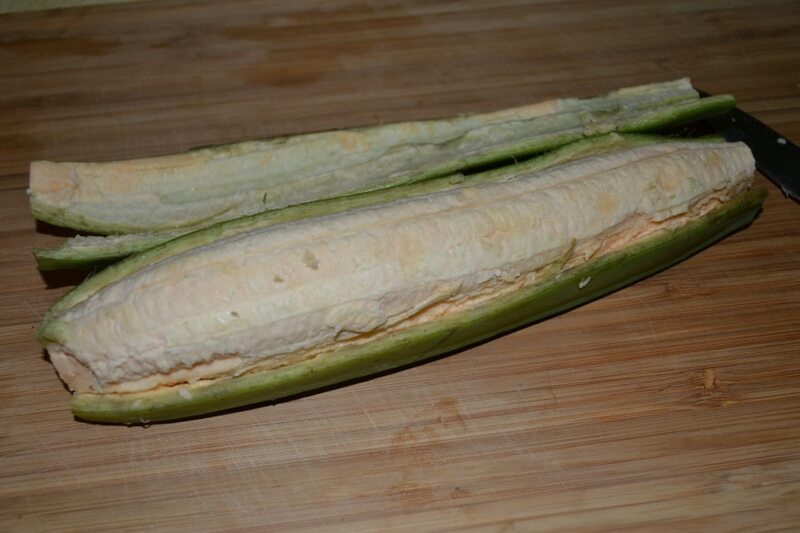 …until the plantain is peeled! You can slice off any stray peel that remains. Continue with the rest of your plantains. 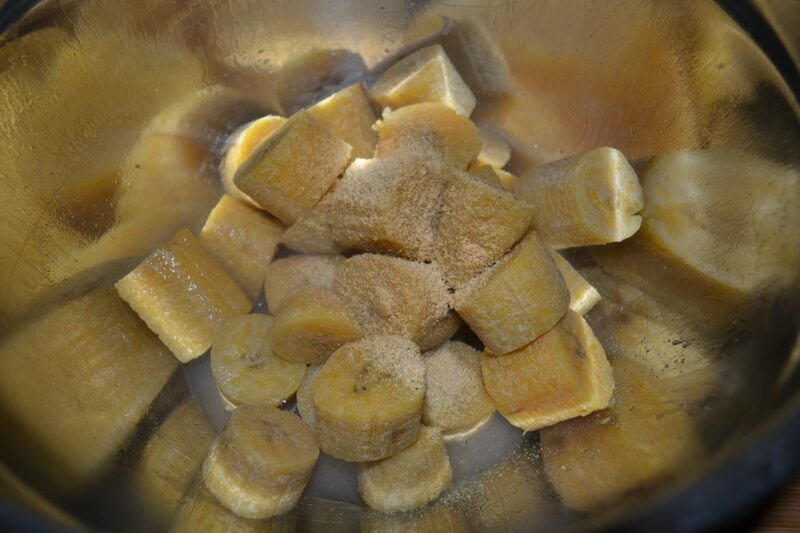 Cut the peeled plantains into 1 inch chunks. 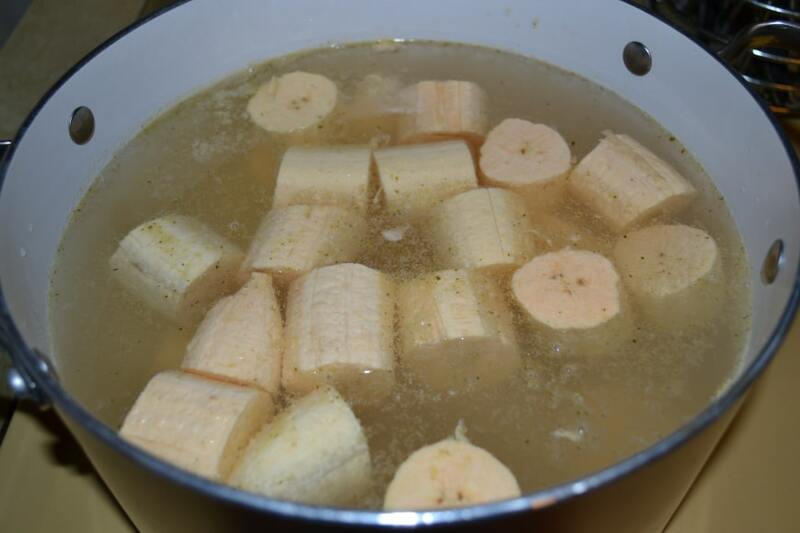 Drop the plantain chunks into the water/bouillon mixture. Cover and bring to a boil. So while the plantains boil, heat up a medium sized frying pan on medium low. 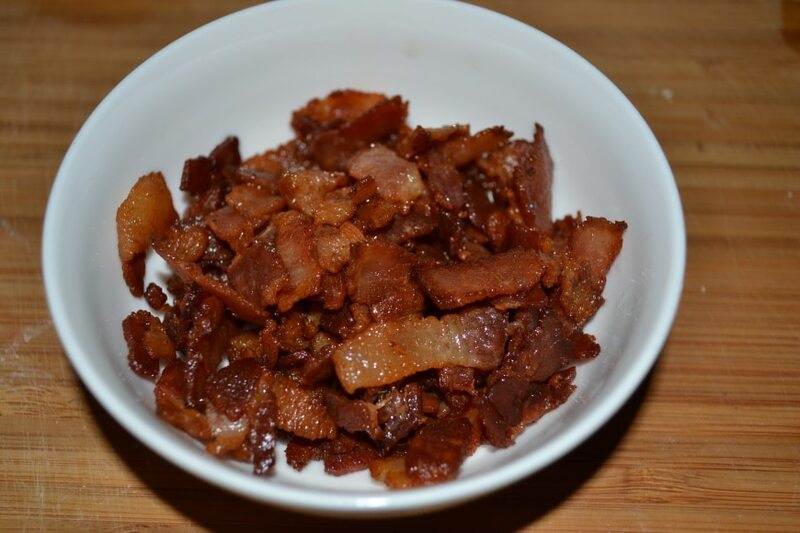 Chop the bacon into lardons (strips) and toss them into the pan. Cook these low and slow, until they’re crisp and most of the fat has rendered out. 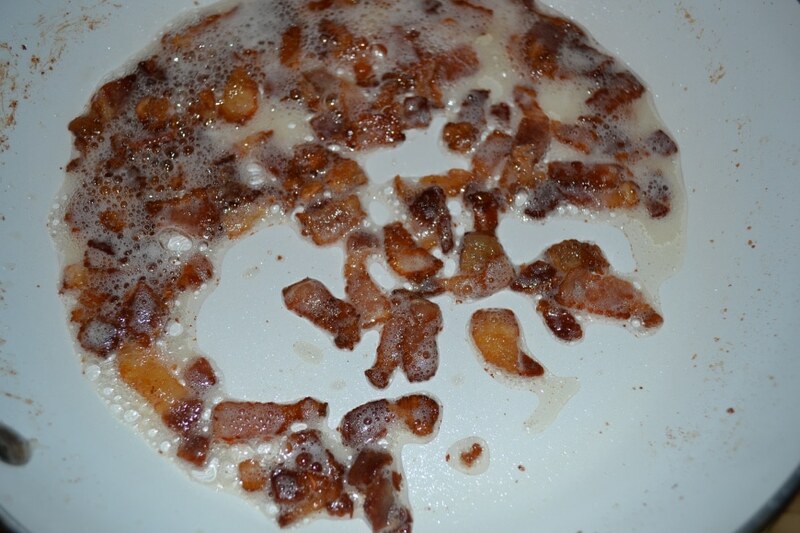 Drain the bacon on a plate lined with paper towel and set it aside. 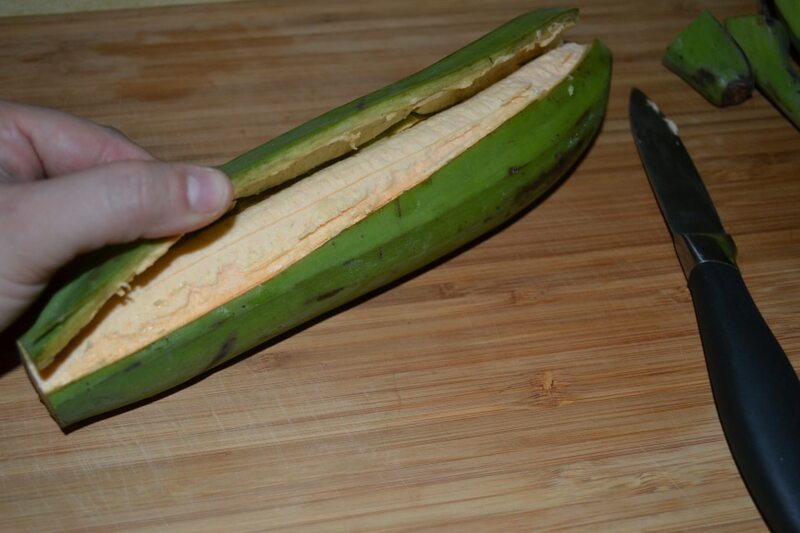 The plantains are done when a knife slides easily into it. You’ll also notice they turn golden yellow in color. 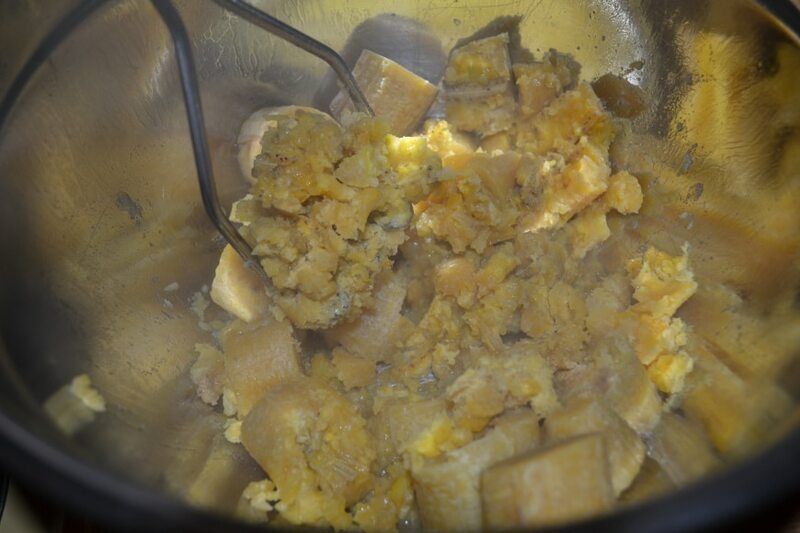 Scoop the cooked plantain into a large bowl and pour in 1/2 cup of the cooking liquid, along with the garlic powder, grated garlic and a good sprinkle of Adobo. 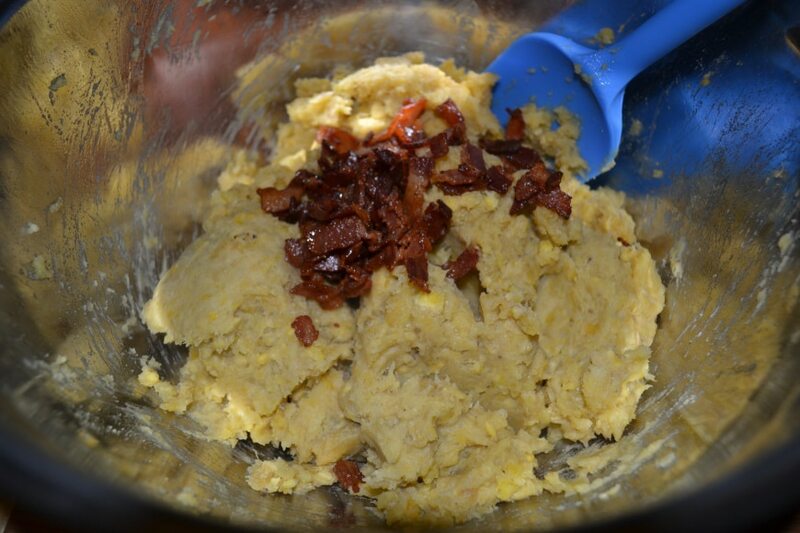 Use a potato masher to mash the mixture together. If you’d like the mixture a little creamier, add in more stock. I added another 1/4 cup. Then toss in the bacon and mix again. Check for salt, if it needs more, add in some more Adobo. To serve as Thanksgiving stuffing, scoop this into the cavity of the turkey when it’s done cooking. Otherwise, you can serve it on the side. 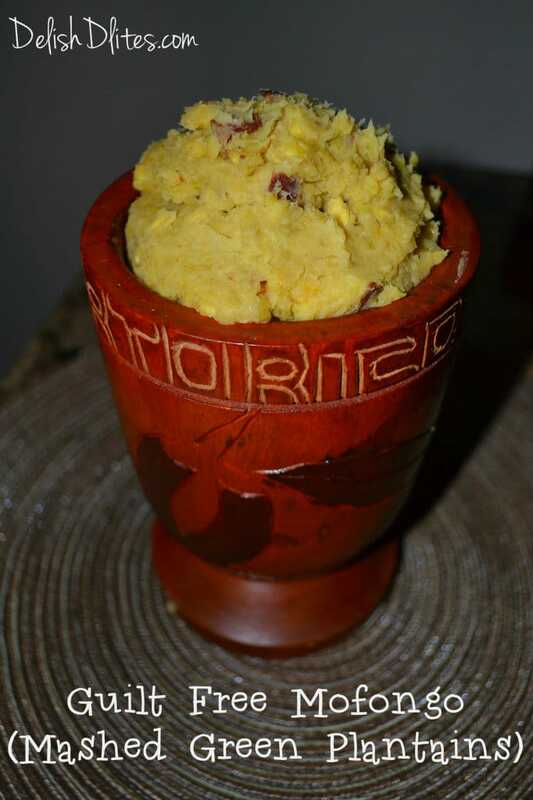 For chicken soup, form 1″ balls on the mofongo with your hands and drop into a bowl of hot soup. Unlike traditional mofongo, which has to be eaten on the spot, this version reheats beautifully, just microwave to heat up, stirring occasionally until it’s heated through. This makes it a great make ahead for parties and holidays. 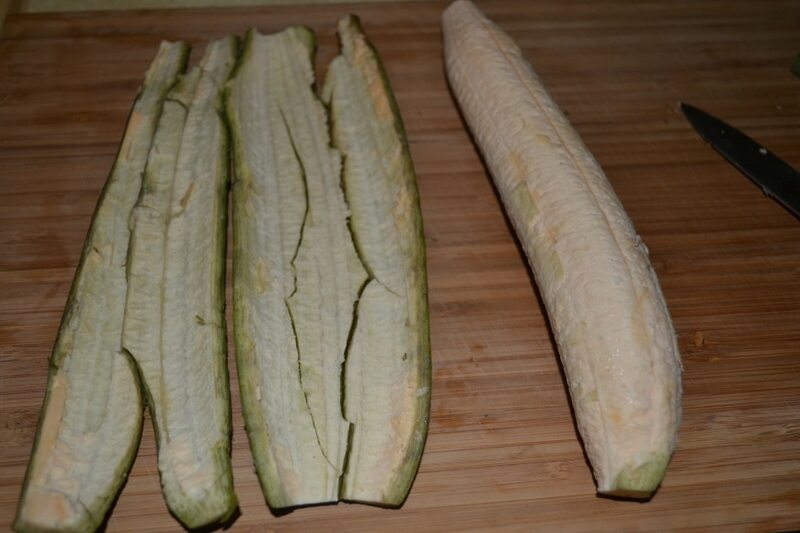 Peel your plantains by cutting off the ends of the plantain. 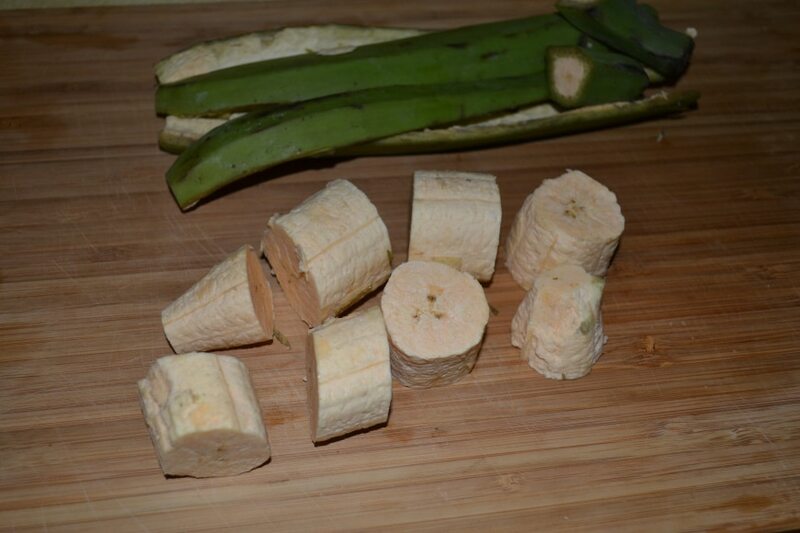 Using your thumb, or the knife, continue prying off the skin until the plantain is peeled! You can slice off any stray peel that remains. Continue with the rest of your plantains. 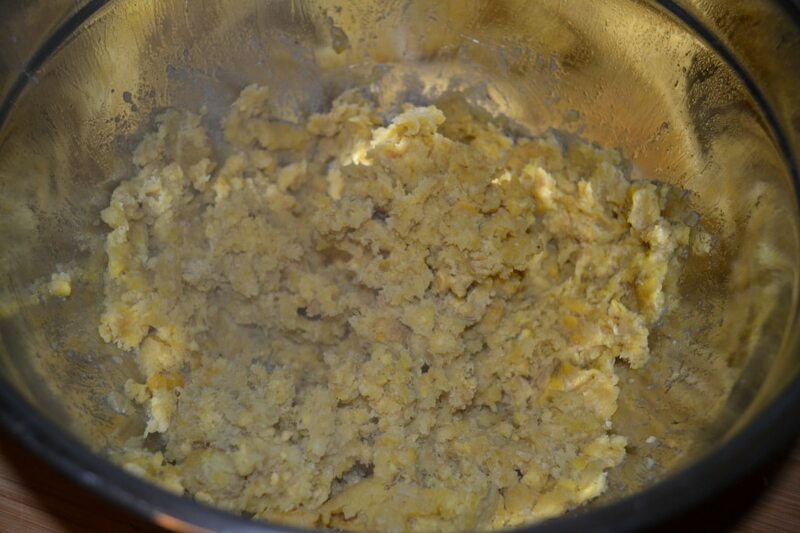 While the plantains boil, heat up a medium sized frying pan on medium low. 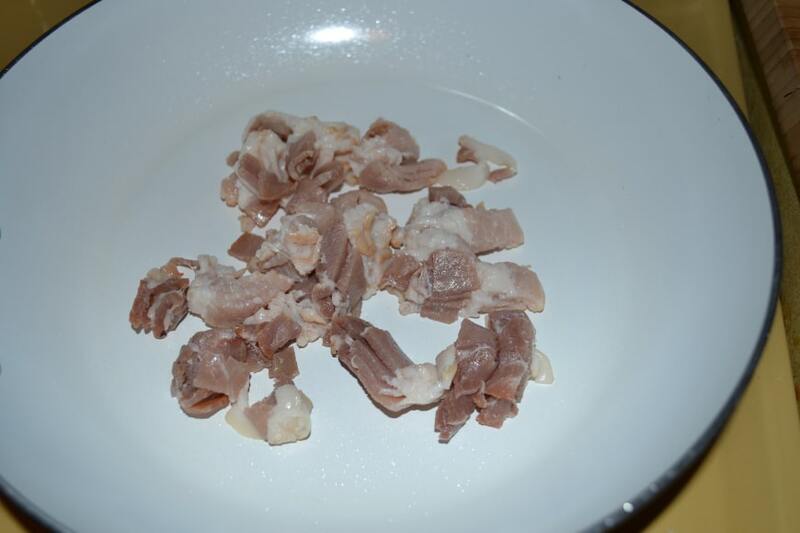 Chop the bacon into lardons (strips) and toss them into the pan. Cook these low and slow, until they're crisp and most of the fat has rendered out. The plantains are done when a knife slides easily into it. You'll also notice they turn golden yellow in color. If you'd like the mixture a little creamier, add in more stock. To serve as Thanksgiving stuffing, scoop this into the cavity of the turkey when it's done cooking. Otherwise, you can serve it on the side. 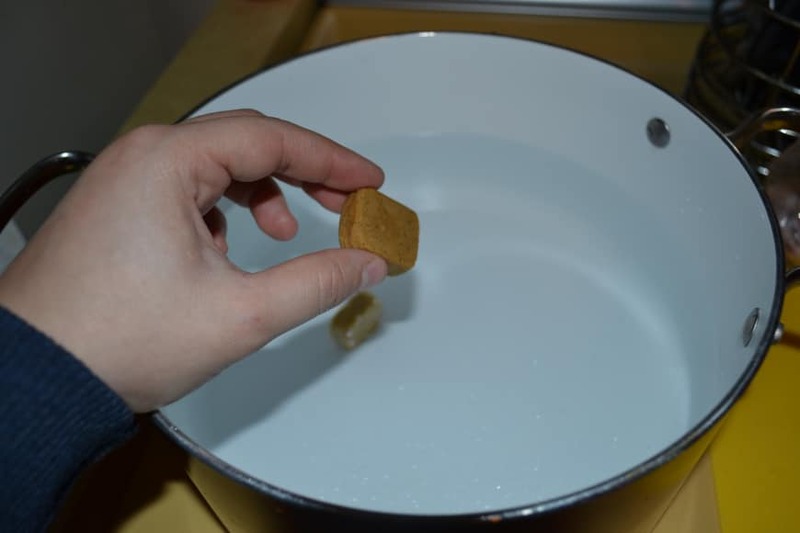 For chicken soup, form 1" balls on the mofongo with your hands and drop into a bowl of hot soup. 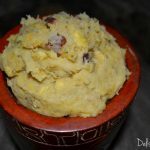 Unlike traditional mofongo, which has to be eaten on the spot, this version reheats beautifully, just microwave to heat up, stirring occasionally until it's heated through. This makes it a great make ahead for parties and holidays. To make it wasier to peel plantains cut into pieces first then the peel is much easier to pop off – been doing this for years – sooo much easier.